Membership has its benefits. Sign up today. Annual inspection by a professional hospitality consultant from an independent inspection company. In addition to the housekeeping inspection, the consultant will make suggestions based on trends and experience, that are designed to help you up your game and improve the guest experience. 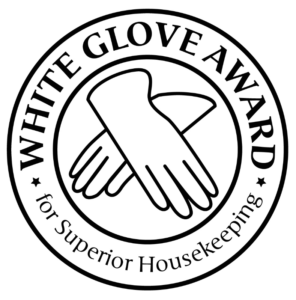 If you achieve a score of 100% for the inspection you will earn the coveted White Glove Award. Should your property not receive the required score, you will be eligible to participate in the Superior Small Lodging Hotel Improvement Program (HIP) where you will have access to consultants and industry mentoring to help you correct the issues and improve your property. The inspection process is a very powerful tool that can assist you in identifying your strengths and possible weaknesses so that your property always meets and exceeds your guests’ expectations. The White Glove Award is given to those members who have a 100% score for the annual inspection. The right to call your property a Certified White Glove Award Hotel. As a member of SSL, you are automatically a member of FRLA and are entitled to all political and educational tools available. Members of SSL receive a $100 discount on VisitFlorida membership (a $295 value). SSL members who are also members of VisitFlorida receive an enhanced listing. Members of the Superior Small Lodging Association receive negotiated discounted rates for Pay Per Click advertising on travel sites such as attraveldeals.com. During the year many co-op marketing opportunities become available for SSL members both regionally and state-wide. This allows our members to participate in marketing and advertising that you might not be able to afford on your own. Pay attention to the emails that you receive to make sure that you don’t miss the opportunity that is right for you. Superior Small Lodging members have an enormous advantage over the go-it-alone small lodging properties. Working as collective makes members’ years of experience available to other members. These are just a few opportunities to network with other members and other industry partners to discuss the latest trends or favorite vendor opportunities. Enjoy Stay-Cations at participating Superior Small Lodging properties around Florida at reduced rates. Available to all SSL members and their employees. No room at the Inn? Have a guest traveling to a different part of the state? Superior Small Lodging members are encouraged to refer from within. You can confidently refer a guest to another member property and support your fellow SSL members. The Superior Small Lodging Emergency Disaster Program can assist keeping you notified of emergency situations and assist in putting a plan in place. Do you have an emergency disaster plan in place? Do you know what to do during a mandatory evacuation to protect your property and yourself? Do you know how to support your neighbors in a disaster without creating a financial hardship on your business? Do you know what to do or who to call first if your property suffers damage during a disaster? Destination Marketing Organizations around the state are tremendous supporters of the Superior Small Lodging Association. Get involved with local SSL members and take a leading role in advocating for the small, independent property in your destination. Use the power of the co-op to market on a destination level.